We went down to the beach late one day, and found the sun was punching tiny holes in the rumbling cotton clouds. The effect was dazzling with infinite golden shafts, rays of sunlight, fanning out across the rolling waves. It seemed that the light once through was trapped to bounce forever between ocean and cloud, leaving us a shimmering mirror of lights beauty, reflecting endlessly back to itself. An infinite reflection on the silver sea. Looking away towards our right the light was softer, muffled and absorbed by the gentlest looking storm clouds. They were gathering with barely a whisper of wind, and with such infinite patience that we hardly noticed. Everything seemed so still, even the waves were sleepy, slowly licking the soft sand with just a sigh. The light was butter soft, and the horizon rolled away into the timeless distance. It was as though infinity had filled the space and slowed down time to a gentle trickle. An infinite moment of perfect beauty at the edge of the endless sea. Then, before our eyes, as the sun continued his daily fall towards the horizon, the clouds thickened enough to change. The sky was divided between left and right, and in that liminal space where the two edges meet, beauty fell from the sky. 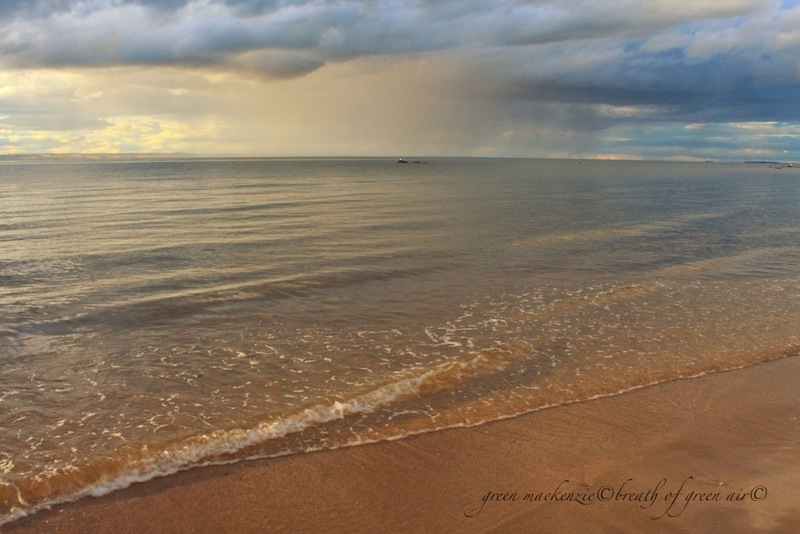 Dark clouds created soft rain over the sea, shrouding the horizon in mysterious infinity, hiding the edges of the earth. In a moment of utter brilliance the sunlight was fractured into all its parts, and a rainbow tumbled out over the waves. It’s magical beauty was reflected from the still water of the sea, which held her breath in wonder. The infinite hope of life was bringing beauty and change into our world, and it was all happening right before our eyes. The sun and the sea had woven their endless, timeless spell of healing, and in the unweaving of the light, beauty had fallen into the world. There are endless more posts about infinity at this weeks wordpress photo challenge. This entry was posted in change, elemental, mindfulness, nature photo, philosophy, photos, relaxation, spiritual, weekly photo challenge and tagged change, elemental, mindfulness, nature, photography, postaday, rainbow, relaxation, seascapes, spiritual. Bookmark the permalink. The brillance on the first photo is really amazing.. I adore your butter-soft light 🙂 Such a treat for us! It was gorgeous wasn’t it….I live the idea of ice cream coloured sunshine 🙂 yummy! The post I referred to above is duly posted. The pictures don’t convey it the way yours do, though. Sorry, I didn’t see the rest of the pics too!! Nice captures! That little bit of rainbow showing up between water and cloud really lights up the entire picture, connecting heaven and planet in a magical way. Thanks. David, it really did feel like a magical time. The air was so still and warm, and even before the storm gathered itself the light was so beautiful…..then came the rainbows 🙂 a photographers dream! Seonaid you are truly gifted. “An infinite reflection on the silver sea” – you stole my heart there, but honestly, this entire post is so… totally amazing – thank you! Bravo Seonaid! 🙂 Amaizing photos! Why thank you 🙂 Moments like this soothe my heart for months…..long after they have passed. That’s what I love about photography…..catching a drop of that fleeting beauty of light. Completely stunning. I was earlier remembering the ethereal quality of light one gets there, while preparing a post on a place with a differently striking quality, but one which arouses the same feelings of awe. Thanks Colin, ethereal is a great word for this space where the light bounces around so beautifully. Well, I’m glad you found that great line a home! Sometimes we have a great line (or even whole vignette) and we’re dying to use it, so we stuff it into a story, but we know deep-down it doesn’t fit. So tempting to leave it, but it’s no good. This time, it was totally right. Hurray. Breathtaking – especially the last one. Beautiful pictures Seonaid, and a very restful description. There is always a warmth to your photography and your words echo my own thoughts on the healing powers of the landscape. 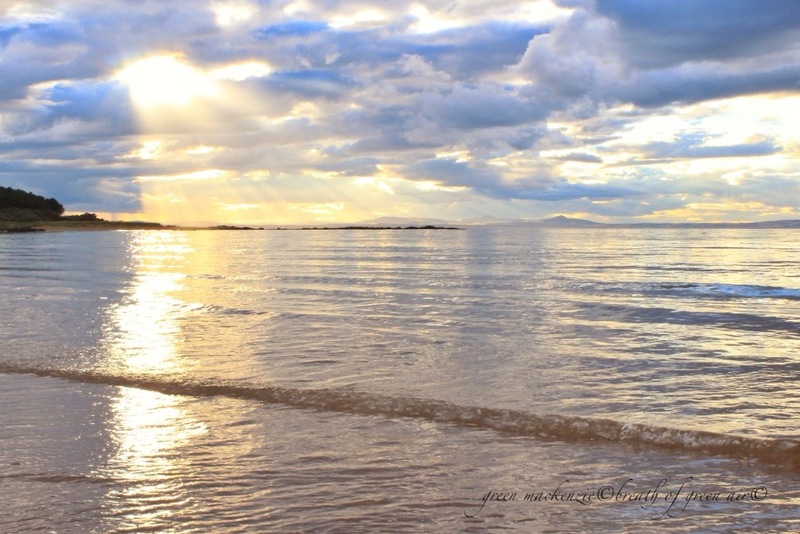 Seonaid you have captured in words and pictures the miracles of natural beauty and light that we all are constantly surrounded by. I have printed out the last picture as a reminder to a class I am teaching today – Decrease Anxiety, Indulge Inner Peace – that the natural world is a companion to visit and be aware of often to instill peace, calm, awe and wonder. Thank you!! I love the way you caught the wave in the first photo and that rainbow is, of course, amazing. All lovely photos and your words are as well. 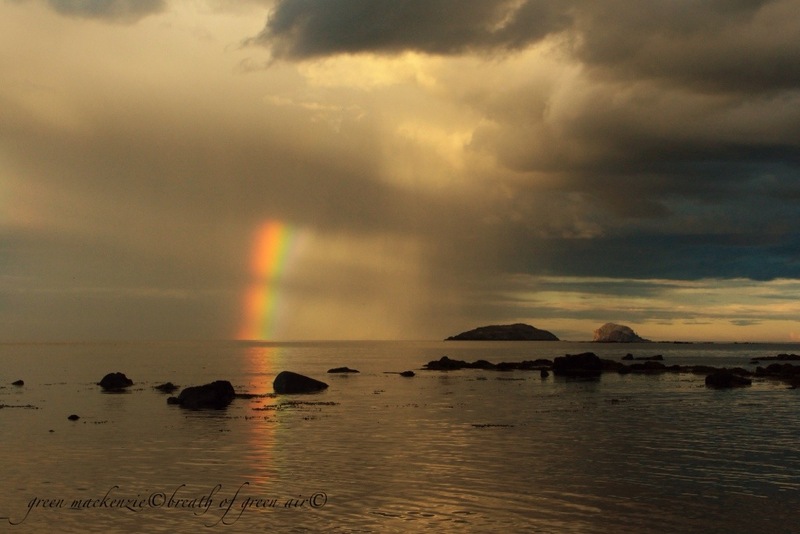 Thanks Janet, it was a gift of a day, and the rainbow was incredible the way it appeared. It lingers long in my memory. Indeed, water and light always make such a good combination. Loved your coastal photos too. What a wonderful experience. Nicely captured, too. Gosh how incredibly beautiful. I’m not sure which I am more swayed by- your wonderful photos or the words you have used to describe your experience. Either way – you have captured that experience of intimations of the infinite beautifully. it was an incredible late afternoon, and I felt as though I had been transported beyond the normal world….the way the light was being reflected and bounced around the estuary was very otherworldly…and then came the rainbow 🙂 So glad you enjoyed the combination of words and photos. Thank you, I almost couldn’t believe it when this rainbow appeared. the light was so gorgeous anyway and I had caught some lovely shots I was really pleased with….and then this. Like an over sized cherry on an already delicious cake! A couple of minutes later it became a double rainbow…..a gift from nature which left me grinning ear to ear!